Some very special guests were in attendance at the DCI Orlando event this past Saturday, July 12. Members of the Central Florida Boys & Girls Club, youth ages 5 to 14 who participate in a local drum line supported by NAMM: the International Music Products association and area music stores, had the chance to enjoy their very first drum corps show. At the show's intermission, members of the Blue Stars came into the stands for a surprise visit with the Boys & Girls Club drummers. The Blue Stars members shook hands, answered questions, and even let the kids do a little bit of drumming on one of their snare drums. "I had a chance to speak with a few of the kids and was very touched by their reactions and enthusiasm for what they were seeing on the field," said John DeNovi, DCI director of business development. 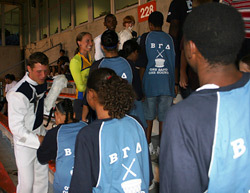 "The looks on their faces when four members of the Blue Stars came into the stands to meet them was priceless! I'm not sure who got a bigger kick out of this... the kids, or the members of the Blue Stars who did such a great job making our guests feel so special." Boys & Girls Club students have been invited by Drum Corps International to three more DCI Premier Events this season, including 350 members in San Antonio, 400 in Atlanta, and another 100 in Bloomington, Ind. for the World Championships. 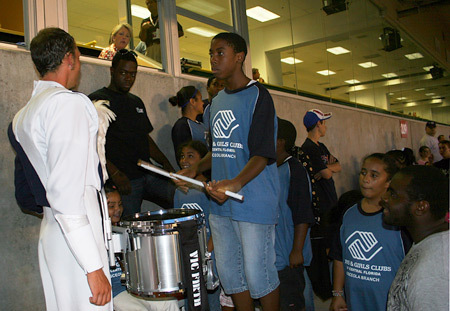 Members of the Central Orlando Boys & Girls Club do some drumming with the Blue Stars.